Uh-oh! Maggie’s favorite treat isn’t a dog biscuit or bone. It’s a pillow! Young readers will delight in the rhythm and rhyme of a puppy’s race around the house with her stuffed-with-fluff prize and then cheer on a little girl in dogged pursuit of her puppy. 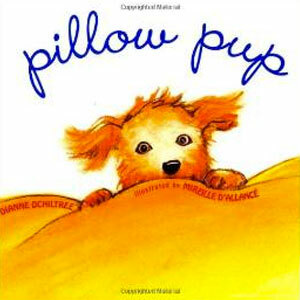 A fun read-aloud for the younger set and perfect for dog lovers of any age.